Dr.Usa Bunnag (left) performs dental work on a child as part of her "Smile on Wings" program that provides free dental work to children in Thailand. 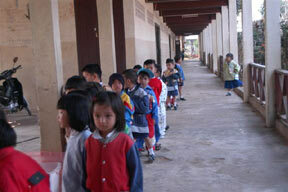 [photos compliments of Dr.Bunnag] Thai children line up for the dentists to examine their teeth. Dr. Usa Bunnag, a former Blair ESOL student who came to the United States about 27 years ago, through hard work has become a prominent dentist in Bethesda and has found a way to use her profession to help people from her native country. Dr. Bunnag, who is originally from Thailand, attended Blair for grades 10 through 12 and was in Mr. Bellino’s ESOL class. When she came to this country one of her dreams was to go back to Thailand and help her country. Now she has come up with a way to do that through a program called “Smile On Wings.” The program was created for giving dental care to children in Thailand. Now a citizen of the U.S, Dr. Bunnag became a dentist practically by chance. She always wanted to become a doctor, but her dream seemed almost impossible. After graduating from Blair she moved out of her father’s home due to family problems and eventually got married. Dr. Bunnag didn’t start college until she was 23. By then she had her first son. While working for a dentist as an assistant, she decided to start college with the encouragement both of her husband and her boss. But the task of going to school and working was a hard one. “It wasn’t easy to do it with working and taking care of two children of my own and a step- son,” Dr. Bunnag explained. Dr. Bunnag attended Montgomery College, where she took pre-requisite courses for dental school. It took her five years to get 60 credits, but after that she was accepted into a special program at Howard University, where she studied to become a dentist. Dr. Bunnag’s dream and goal of going back to Thailand to help her people became stronger throughout the years. 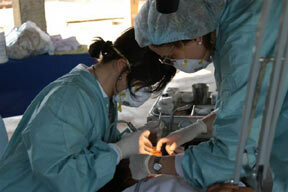 “The idea of doing mission dentistry has always been in the back of my mind for a long time,” she said. That’s how the program “Smile On Wings” came to be. Dr. Bunnag started “Smile On Wings” after she went back to Thailand for a visit after being away from her homeland for 26 years. On her trip, she saw that there were a lot of poor people and a lot of children that needed dental care but were unable to obtain it. What she saw during her visit is what made she decide to do something about it. “It ignited my passion, so I began inquiring about starting a project,” she explained. With the help of a former minister of Health from Thailand, Dr. Bunnag was able to propose her idealistic project. When she was back in the U.S., Dr. Bunnag started to work on setting up a special foundation. In October she went back to Thailand to “test the water” and to work with the local hospital. After that she came back to the U.S where she found dentists, Dr. Norman Fox and Dr. Karen Dunegan, and an assistant Mrs. Martha Hood, who joined her in her challenge. Due to a shortage of funding all volunteers had to pay for their own trips and expenses. Now the program is growing. This has enabled Dr. Bunnag to plan to take a team over twice a year. Also the program has been receiving a lot of interest from dental professionals. Because of its good success and outcomes, the goal of the program has expanded. “In the future, I would like to go to other countries too. We will work on visiting Vietnam, Cambodia, Laos, the Philippines, and South America,” explained Dr. Bunnag. One thing that many immigrants have in common is that they never forget their native countries, and many want to do something to help their countries. Dr. Bunnag is someone who has made that desire a reality and she has made her dream a reality, “I have discovered my true calling and I want to share my experience with as many people as I can,” Dr. Bunnag said. 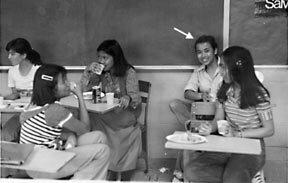 As a student in 1978, Dr. Bunnag (back,right) was active in Blair's International Club. Here she is pictured at a club party.